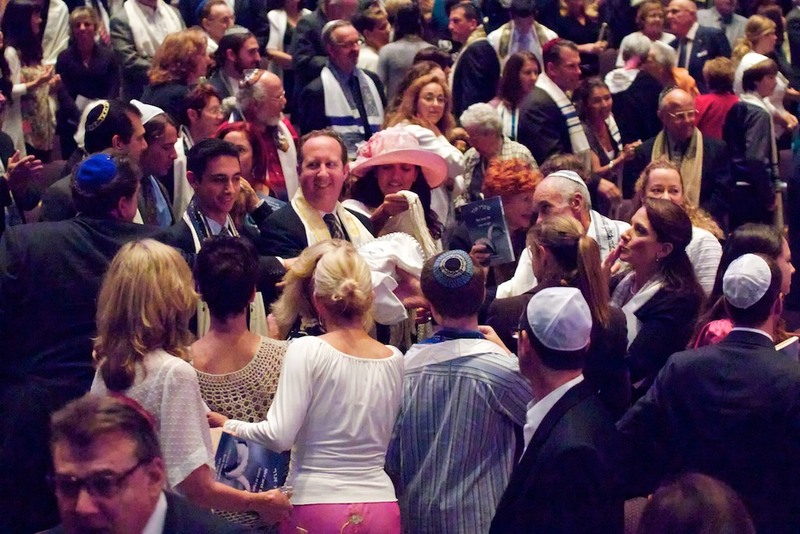 Challenge: Over 1,000 congregants gathered for Rosh Hashana and Yom Kippur services. All 1,000+ worshippers want to be able to touch or kiss the Torah during the Hakafah. We have only two aisles in the Fred Kavli theater in Thousand Oaks where we worship, and those aisles go up the sides of the theater. Too much of a balagan (craziness) when Torah scrolls are carried up the aisles because of the lack of space in those side aisles. Idea: Have you ever seen a concert when the musician on the stage turns around, leans back, falls into the up-stretched arms of the crowd? It is called “crowd surfing“. Sometimes it looks like this. Solution: What if the Torah went crowd surfing? Since we have so many congregants who want to honor Torah by touching it or kissing it, and since we only have two aisles down the sides, we want to introduce Torah surfing. After we remove Torah scrolls from the Ark and sing the appropriate prayers, we will send two scrolls up the side aisles, and two scrolls up the center of the crowd. If Torah comes to you, hold it like you would a baby. Use clean hands (and a pure heart); adults only hold it. Using all necessary means, do NOT drop the Torah (which results in a 40 day daytime fast for this whole community; or instead, expect to quadruple your High Holy Day pledge). Go slowly so that everyone has a chance to kiss Torah, using either their tzitzit, their machzor (prayerbook) or their CLEAN hand. Ushers will be at the back of the sanctuary space to receive the Torah scrolls and bring them back to the bimah. The Result? Check out this video by Michael Kaplan (Torah Surfing (TM) may be seen midway through are pictures/video). Worshippers lovingly carried Torah, held it alot, and stretched out so others could get to touch/kiss the Torah. It was freilich (happy, joyous) and meshugenah (crazy). And it increased Ahavat Torah (the love of Torah). Amazon’s Kindle was made in Israel?! A World Autism Center is being build in Israel?! Israel’s have discovered how to float solar panels on water?! A bracelet made in Israel can tell caretakers when an epileptic seizure is happening?! The Mideast’s first synchrotron is being built in Israel with researchers from across the Mideast?! I recently rediscovered a fabulous website about Israel: Israel21c.org. It is well worth a look or two or three. Israel, to the extent that it is understood by Americans at all, is generally seen as a place of war; a place that is characterized by virtually nothing but the conflict between the Israelis and the Palestinians. So often we focus on the conflict in the Mideast. Yet, Israel is regularly is having a major impact on our world in very positive ways. Israel and Israelis are having an impact on individual lives through their efforts in health, technology, culture, democracy and clean tech. Israel21c, a non-profit educational foundation with a mission to focus media and public attention on the 21st century Israel that exists beyond the conflict, identifies, researches and reports on how Israelis create, innovate, improve and add value to the world. Studies substantiate that when Americans learn about the ways in which Israel adds value to their lives, their affinity and respect for Israel increases. We improve Israel’s image around the world by allowing people to understand the reality; Israel is seen through the lenses of its humanness, its diversity and all that it contributes through medical advances, technological innovation, art, culture and acts of human kindness. Amazon’s Kindle: A Made-in-Israel story: They made Java “cool” again by using it to develop a device for reading the Kindle, and once again a major tech invention emanates from Israel. World autism center in Jerusalem: At the first global research and education center for autism, to be built in Jerusalem, the plan is to integrate all the systems that work. Solar energy that floats on water: Award winning Israeli company Solaris Synergy has designed solar energy grids that can float on water, reducing energy production costs, and preventing water loss. Swift help for epilepsy: The new electronic EpiLert bracelet under development in Israel will signal caregivers when the wearer begins to suffer a dangerous seizure. When the author of the Biblical book of Ecclesiastes complains ein chadash tachat hashamayim – there is nothing new under the sun, he seems to express a disappointment, even frustration, perhaps with the stagnant routine into which his life descended. His insight stands in direct opposition to another strand of the Jewish experience, namely the search for chiddush, for the innovative idea. As the world changes, as our lives are transformed by these realities, we seek new answers and new connections with community and with divinity. Enter any Beit Midrash (Jewish study hall) around the world and you will find people searching the ancient words for a chiddush, new insight, to make life feel alive and meaningful. Our synagogue, Congregation Or Ami (Calabasas, CA) – so energized and flexible – is a light for so many people in significant measure because of our commitment to remain vibrant and innovative. We eschew what has been described as Ecclesiastes’ cynicism. We embrace constant transformation, insisting that like the Israelites who left Egypt but retained a slave mentality, we will not become enslaved to the “way we have always done things.” We demand of ourselves petucha, openness, and self-reflection that looks at who we are and constantly strives to refresh and rejuvenate. Our cantor keeps abreast of the newest trends in Jewish music and melds old melodies with new harmonies to keep us humming a praise-song to the Holy One. Our rabbi attends seminars in person and online to keep reflecting, evaluating and refreshing our community. Our graduate student interns bring fresh perspectives from their teachers, the greatest thinkers of our generation. And our leadership and project chairs – committed to serving in a position no more than two years – seek out the energy and enthusiasm of all our members – veteran and new – to deepen the way our Or Ami community touches lives. 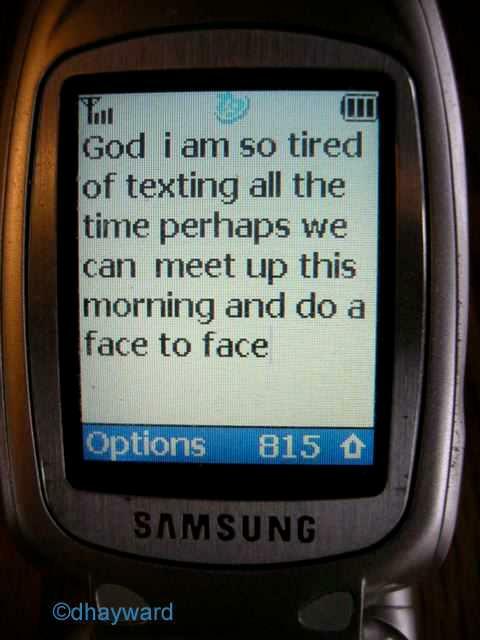 This is how it should be. Toward the end of his life, Ecclesiastes looked out at the world and resigned himself to routine. Or Ami looks out and sees opportunity and possibility, new ways to connect Jewish families to the Holy One, Torah, Israel and each other. That is why I am constantly energized by Or Ami and why Or Ami has a stellar reputation locally and nationally.